but we can also guarantee next day delivery if ordered before midday. 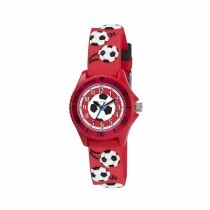 Tikkers kids watches are bright, fun and fashionable with a range of styles and features to suit all ages. All Tikkers watches are designed to be practical and comfortable to wear. Telling the time is easy with the clear dial and brightly coloured hands and numbers whilst the rotating metallic style bezel gives the watch a sporty design. All Tikkers watches have a one year guarantee and a colourful gift box.